A Tablecloth with Logo attracts attention when exhibiting. The front of your tablecloth is free advertising space. It exposes your company name or product attracting visitors. 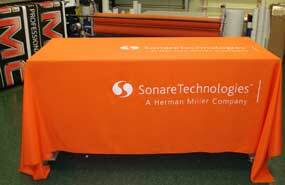 This Orange Tablecloth with "Off Set" logo was designed by one of our clients in Chicago, Illinois. The logo is deliberately "Off Set" to the right side of the tablecloth. Your Custom Tablecloth with Logo is carefully tailored. This logo was applied to both sides of an economy tablecloth. 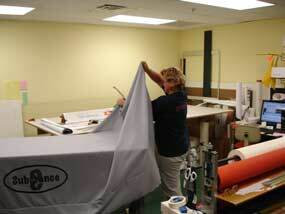 As seen, Debbie makes preparations for shipping a Tablecloth. The Logo is just as the customer ordered. See Tablecloth Care. Others have also taken advantage of our discount prices for Banner Stands. The Tablecloth shown to the right, was shipped to Winter Haven, Florida. Their Logo fills the Tablecloth with perfect balance. We will ship your Custom Tablecloth anywhere within the Continental United States with no additional charge.